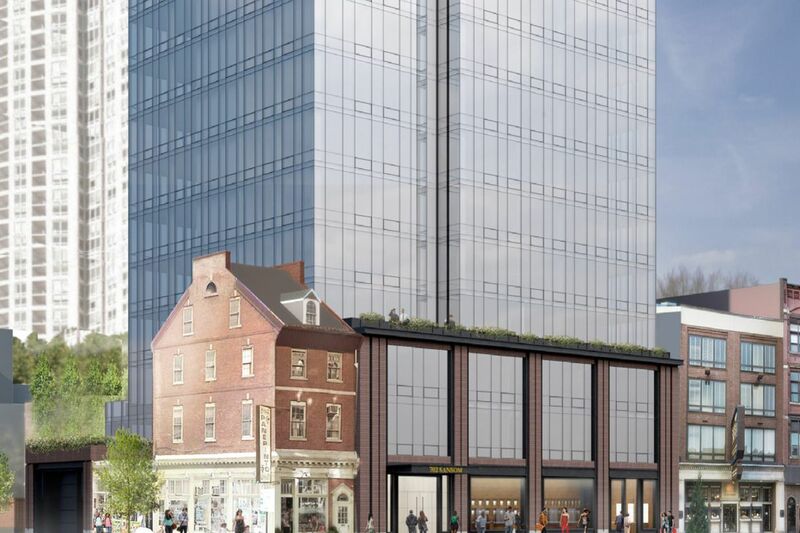 The final design for Toll’s 24-story, glass tower on Jeweler’s Row has become more generic and lifeless. Believe it or not, the Jewelers Row saga is about to get worse. During the nearly two years that Toll Bros. has been pursuing its misguided plan to replace a group of handsome workshops on that storied Sansom Street block with a luxury condo tower, the exact look of the skyscraper has always been in flux. One early design showed a bizarrely two-faced structure, brick on one facade, glass on the other. Even if Toll couldn't be persuaded to preserve the old jewelers' buildings, it was assumed the developer would eventually come up with an architectural design worthy of historic Washington Square. But with Toll scheduled to cross the procedural finish line next week, at a meeting of the Civic Design Review board, it is now evident that the tower's design amounts to a second act of civic vandalism. Generic, placeless, and grossly underdetailed, the 24-story high-rise is an architectural zombie that will loom over both Jewelers Row and Washington Square. Designed by New York's SLCE Architects, the tower offers the public nothing in return for the rich history that Toll is destroying. The Washington Square side of Toll’s proposed tower is grossly underdesigned. The evolution of the building's design has played out as predictably as a Greek tragedy. Each time the Washington Square neighborhood association or design review board would point out a problem with the composition, Toll would respond by having the architects delete the offending element. Most recently, it was the third-floor veranda. That's how public relations works, not architectural design. Because of the haphazard slicing and dicing, the 291-foot monolith is now even more lifeless than before. On Washington Square, the tower's most important side, the glass facade rises like a vertical skating rink for 14 floors before conceding to a modest setback. Though the Sansom Street facade is somewhat better, with a series of indentations breaking up the flat surface, Toll still seems determined to claim almost every inch of air space with its bulky tower. One of the challenges of designing an all-glass skyscraper is that there are no window frames or floor dividers to interrupt the smooth expanses and give the surface texture and scale. Towers sheathed entirely in glass really succeed only when they are exceptionally crisp, like the original Comcast headquarters, or very sculptural, like FMC and Cira. Like Toll's building, Comcast's facade also suffers from vast stretches of flatness, especially on the Arch Street side. But Comcast's tapered, obelisk form, notched corners, and purposeful setbacks elevate it far above the ranks of dumb monoliths. The randomness of the SLCE design is evident in the disconnect between the base and the crown. The bottom two floors on Sansom Street are outlined in brick in a weak effort to make a contextual connection with Philadelphia's loft buildings, none of which exist on Sansom Street. But the top is glass, pleated to evoke the art deco crowns of the 1930s. Although we no longer expect our skyscrapers to be segmented into three distinct parts — base, shaft, crown — there should at least be a logical relationship between the top and bottom. The top of Toll’s Jewelers Row tower features a pleated, art deco style crown. Given that Toll has been pushing this project for more than 18 months, you have to wonder whether this half-hearted effort is a real design or simply a way to get the site permitted so it can be flipped as a ready-to-go development package. Toll has followed this script before. After acquiring the handsome Society Hill Playhouse, built in 1898 as Garrick Hall, it sold the property to a developer who demolished the theater and constructed a barracks-like apartment building. Toll also abandoned a previous condo project on Rittenhouse Square, easily the best address in the city. Originally a Toll Bros. project, the Bradford was built by another developer on the site of the former Society Hill Playhouse at Eighth and Rodman. High-rise condos are notoriously difficult to finance and sell in Philadelphia, which is one reason the city has produced only a few hundred, for-sale apartment buildings in the last decade. To appeal to discerning buyers, developers usually hire a big-name designer to create an alluring exterior. Toll used that strategy itself when it hired Rem Koolhaas, one of the most famous architects in the world, to design a building in New York's Chelsea neighborhood. Built in 1898, the Society Hill Playhouse was originally known as Garrick Hall. It was demolished in 2016. Toll's Philadelphia project has none of that pizzazz. Its architect, SLCE, is not even known as a design firm; it primarily turns out construction drawings for more polished architects. It also seems a little strange that most of the condos won't have balconies — not even those overlooking Washington Square. It's hard to imagine Philadelphia buyers paying big bucks for a unit that offers no outdoor space. The city seems powerless to stop the farce. Hoping to elevate the quality of design in Philadelphia, the city set up the Civic Design Review board in 2011 to vet all large projects. A great idea in theory, the board has been nearly useless in practice because it can't reject a subpar design. It can merely force the developer to attend a follow-up session. So while Toll got an earful at the board's February meeting, the design it will present at Tuesday's meeting includes only a token revision. Initially, it seemed the Kenney administration might intervene to stop Toll from gutting Jewelers Row. The district is the oldest and most intact jewelry district in the country, a haven for skilled artisans, and a popular tourist destination. It's also just a block from Independence Hall and Old City. After news of Toll's plans broke, Mayor Kenney even criticized the design publicly, urging the developer to shorten the tower and retain the building facades. Since then — radio silence. The Historical Commission has been its usual passive self. Although the Preservation Alliance submitted a nomination to make Jewelers Row a historic district more than a year ago, no action has been taken. The designation wouldn't save the five buildings Toll wants to demolish, but the designation of a historic district would give the city more say over the design of the tower. Meanwhile, the Planning Commission has yet to take any action to downgrade the zoning on Sansom Street, a measure that would go a long way toward protecting the remaining buildings. The development boom, which has been cutting a swath through Philadelphia for more than a decade, shows no signs of abating. Unless the city starts making choices about what parts of its architectural patrimony are worth saving, we can expect more Jewelers Rows. Jewelers Row, between Seventh and Eighth on Sansom Street, as it looks today.